New Offer - Kids Eat FREE - 1 free kids meal with every full priced adult main course. Get down to us now with the family!!! Accommodation - For the best deals call us on 01349 861500 today. 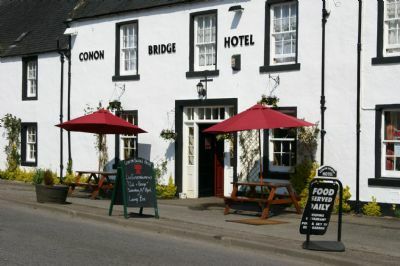 The Conon Bridge Hotel, a proud member of The Scotch Beef Club, is situated amongst beautiful highland scenery alongside the River Conon, an area which thousands of visitors enjoy every year. Situated close to Dingwall, the ancient Viking capital and within 10 minutes drive of Inverness, the capital of the Highlands the hotel is ideally situated to give you a rural base with easy access to centres of activity. Our establishment is family friendly and our attentive staff will attend to all your requirements to ensure that you get the most out of your visit to the area. 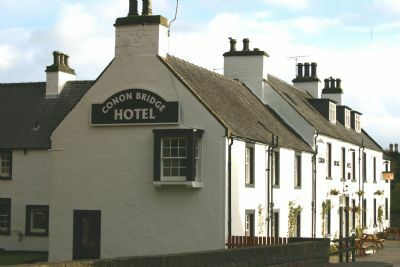 On offer at the Conon Bridge is a charming traditional atmosphere, in keeping with an 18th century building and everything you need for a comfortable stay is on hand. We have a lovely restaurant, and a cosy lounge bar where you can enjoy our excellent cuisine and fine ales, lagers and wines as well as a public bar where you can watch the latest live sports or play the pub games on offer. All in all you have the perfect blend that helps you take advantage of the Highlands pace of life. The Highland region is rich in culture and places of interest to visit for all the family. The hotel nestles the Conon River where you can watch local anglers landing their catch ( or take part yourself should you wish to do so) and the local scenery is magnificent. Close by there idyllic beaches, superb stretches of water and the area has many hills and walks that will keep you exploring for ages. Our roads are quiet and driving is once again enjoyable allowing you to visit the many attractions that the area has to offer. Come and enjoy the Conon Bridge experience - we are sure you will want to return.